If you want to use your Gmail with your own domain to send mail from one of your application, using Gmail’s SMTP (Simple Mail Transfer Protocol) server, it is very easy to set up. 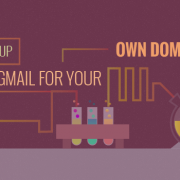 If you haven’t had a Gmail user with your own domain, you can purchase one at https://ggappsfree.com/#pricing. You may want to create a new user for this purpose, or use the one that you created initially. The actual configuration of your application’s mail settings will vary, depending on the software, but the details that you will need to set up working outgoing mail are generally the same. Now you should be able to send and receive mail with your custom domain—test it out by sending and receiving mail via your new Gmail account. Now is a good time to add additional mail users, and configure other mail settings, if you need to. You may access your mail accounts through Gmail, and you may perform Google Apps administration through the Google Apps Admin Console.